Snow place like home: What a Start for September! What a Start for September! Isaac and I have had an interesting month already. We spent Labor Day morning at my classroom, and Isaac put up posters and lowered heavy boxes for me that he had put up to store over the summer. I frantically wrote lesson plans and put everything in its place. I feel behind because I didn't do much planning for the regular school year during break with summer school to plan for, but I am keeping my head above water so far. The next night was a Teacher Work Day, so I made copies, cleaned and got ready for students to come on Wednesday morning. Isaac got a phone call from Cattlemen's that night to tell him that the Newark location had been closed. We were more than a little bummed about that. He liked it there, made good money, got better hours, it was only a 7 minute walk from home, and they were considering him for a new position over banquets. (sigh) He is still looking for a second job. School has been different this year. My seventh grade honors classes are new for me, and I am thoroughly enjoying them so far. They understand sarcasm and puns, volunteer good responses in class, and have clear, organized writing for the most part. Also, seventh graders seem to come with a little fear built in, which has been funny to watch. My ELD classes, on the other hand, are INSANE. It's like the flood gates opened with the Olympics. For two periods every day, I have 31 students who speak little to no English. They are so relieved to be in a place where everyone has the same issue that they talk all the time (not in English, lol), and they need more help than I am capable of giving. There are always many hands waving in the air. It's completely exhausting. The only other ELD class is a levels 3 and 1 combo, which is a very challenging class with that vast difference in ability (3s being nearly ready for mainstream English and 1s being non-producing non-speakers), and she has 40 students! As EL Liaison for our school, I brought it to the attention of our administrators that our numbers are simply to high for those students to receive the help they need. They appealed to the District Office, and we were today granted another section for ELD. Guess who gets to teach it. I'm excited to be making more money, but terrified of planning four different classes every day without a prep period. What a boat we find ourselves in. Isaac is looking for another job, and I have more work loaded on me for the year. I guess that's a blessing. Good luck with the extra class! Hopefully, that also means your other ELl classes will have a few less students? I remember agreeing to teach an extra "gifted" class, requiring me to have one more hour of lesson plans ready then the other sixth grade teachers. It was definitely time consuming & tough. But I also LOVED it! 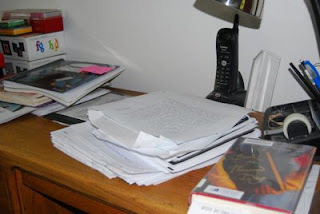 And did I notice The Book of a Thousand Days on your desk too? Let me know how you like it. I really, really enjoyed it...but I don't think Whitney did as much. What a schedule!!! Whitney and I are in a very similar boat with hopes for change and the feeling that they are around a corner. Good luck Isaac with finding a second job. My least favorite thing in the world is job hunting. oh! I hate no prep! That's just the pits! But if it makes you feel any better, Centerville teachers are facing the same issue with all the classes on campus. I don't know if ANY teacher over there will have a prep... so much for last-minute subs... Hey! at least you never have to do that! Anyway, let me know if I can help out with ELD grading or anything! Newark Cattlemen's closed? SAD! Good luck finding a job, Isaac, and Becca, you'll do great this year.